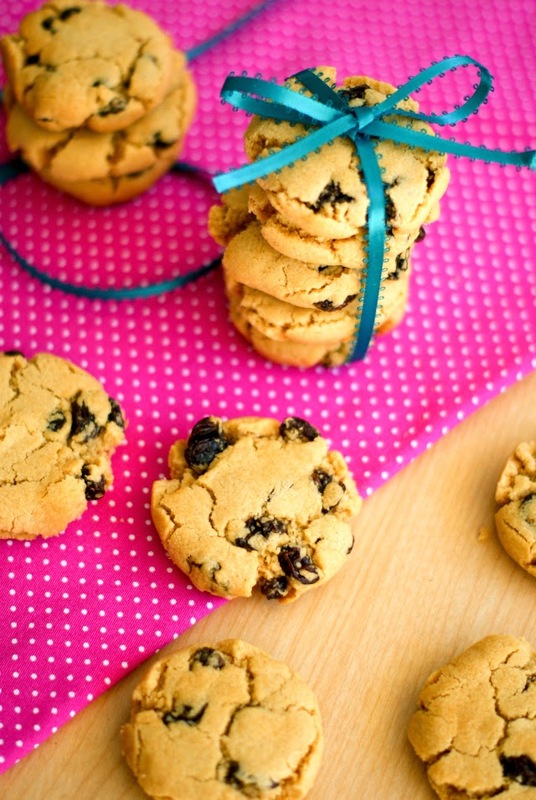 Peanut Butter Raisin Cookies are soft, thick and delicious with a peanut buttery flavor studded with sweet raisins. Every time I bake cookies, I think about how when I was a little girl I wanted more than anything to be a Mom. Part of my idea of what the perfect Mom would do is bake cookies for her kids. Like, all the time. In my Mommy dreams, the Mom makes fresh baked cookies for her kids at least twice a week. Haha. I'm now all grown up and living my Mom dream and, although I don't bake cookies on a weekly basis, when I do pull out the baking sheets, I can't help but smile in my Mommy contentment knowing that I am kinda living the dream. And it totally makes my heart smile to see how excited my kiddos get when I tell them there's fresh baked cookies in their near future. I got this recipe out of a Gooseberry Patch Kid-Friendly Recipe Book all about raisins that I got a while back. 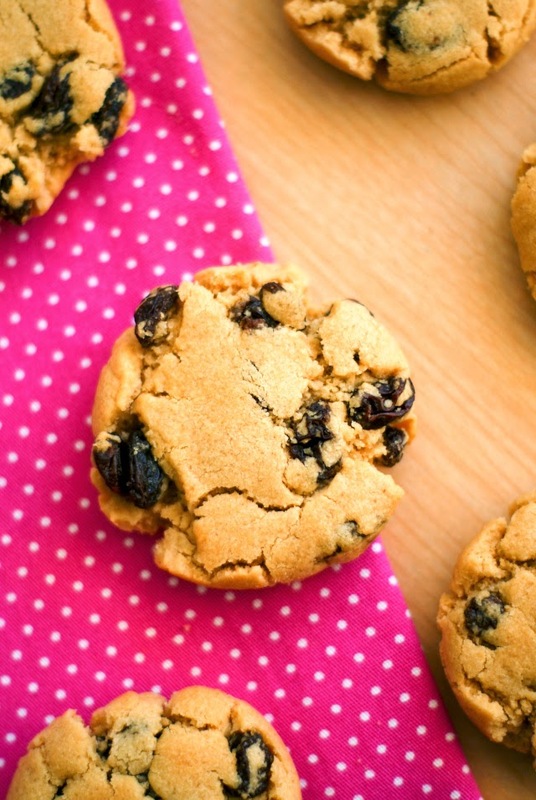 I wanted to make a treat for the kids and I happen to have a bunch of raisins right now, so I was happy when I pulled the book off my shelf and found a recipe that I had all of the ingredients for. I whipped these up while my little guy was napping and when my girl came home from school, there were fresh baked cookies waiting for her. It was a nice surprise for a Monday afternoon. 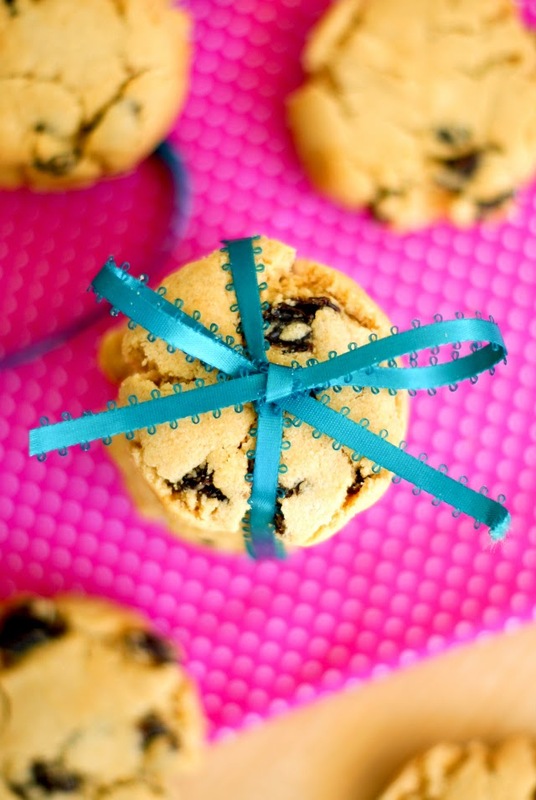 These cookies are thick and peanut buttery and the kids loved them! I might have eaten a few, too. Okay, maybe like four. Or five. Point is, they were yummy! Preheat your oven to 350 degrees. In a mixing bowl, beat the butter, peanut butter, sugars, and egg until well blended. In a separate bowl, combine the flour, baking soda, baking powder, and salt. Add the flour mixture to the butter mixture a little at a time, beating until combined. Stir in the raisins. Roll the dough into small balls (around 1 inch) and place on a parchment-lined baking sheet. Bake in the preheated oven for 12-15 minutes. The bottom should be golden, but not too dark. They will look a little underdone and not completely spread out. Immediately after removing from the oven, press the cookies down so that they are about 1/2 inch thick. (I used the bottom of a drinking glass and it worked perfectly!) Remove to a wire rack to cool. These cookies are sweet, but not too sweet. My sister tried one and said she would have liked a sprinkle of sugar on top or maybe some chocolate chips. I'm more of a savory girl, so I didn't mind that they were not super duper sweet. They were perfect for me! Source: Sun-Maid Kid-Friendly Recipes from Gooseberry Patch. I just made these. I added vanilla and cinnamon. They came out great. I'm so glad to hear you enjoyed them. Vanilla and cinnamon sound like great additions!